I am 12 weeks pregnant now, which means that I am nearly out of the first trimester of my first pregnancy. I have to say, I am totally relived to be out of this first trimester because it was HARD for a number of reasons (one being not telling anyone about the pregnancy!) It was also a learning experience for me as a woman, a wife, and a person. I wanted to share some of my experiences in the hope that others can relate and/or feel better (or just good) about whatever is going on in their first trimesters. I hope you will all share your experiences with me in the comments section below!!!! Call me crazy (it wouldn't be the first time) but I thought that I wasn’t going to have morning sickness...that is probably because my mom bragged about how she never had any! If you are one of those women who don’t get morning sickness, you are lucky honey! But for me, at seven weeks, I was not only nauseous, but I threw up a number of times. It was crazy-terrible because nausea, for me, is an awful feeling. The only way to beat it? Eat. I kid you not. Eating every two hours helped a ton, but it wasn’t the easiest thing to get used to. Luckily, about week 10 or 11, the nausea began to ebb. So if you have morning sickness hang in there, it gets better. The strangest part of being pregnant was that the idea of certain foods made me feel sick. It wasn’t actually the food itself. Often, once I started eating, I was just fine, but thinking about eating made me grimace, literally. This led to some funny eating weeks....like the week I ate spaghetti with clam sauce five days in a row because that was all that sounded good. Or the fact that I have eaten more caesar salad in the past month than in my whole life. I just went with it. Whatever sounded good was what I ate. Period. I tried to keep it as healthy as possible, but honestly when you can’t stomach much, it doesn’t much matter. I sleep a lot anyway, but the type of tired I was: insane. Somedays all I did was watch television in bed because anything else was too taxing. I fell asleep at 8:00pm on the regular. I skipped workouts because I just couldn’t get out of bed. It felt like it was going to be forever, but it wasn’t. My energy started to come back as I approached the second trimester. So don’t worry, your energy will come back, too. I would cry for no reason at all. One minute I would talking normally and the next, I would be crying. It made no sense. Other times I would be angry over something so simple, I seemed like a crazy person. The emotional roller coaster of those hormones hitting my system was not pretty for a couple of weeks there...even my mom told me I was being, eh-hem, bitchy. Worst part? I couldn’t disagree with her! Meditation helped...but so did alone time. If no one is around, there is no one to get mad at! I have always been the type that slept on my stomach, until now. The first week I was pregnant that went out the door because my breasts were so sore I couldn’t lay on them. I’m learning to side sleep, but it doesn’t come easy. Here’s a tip: pillow between the knees, and one down the side. I’m getting the hang of it, and I’m getting one of those pregnancy pillows soon too! I have read how women hold out on getting in the maternity pants, but at 12 weeks, I had to give in as my lil' bump popped out. My pants were just uncomfortable. And wearing them unbuttoned just didn’t make sense to me. Maternity pants are COMFORTABLE and hey you’re pregnant, so why not? I get it ,though, because I was a bit reluctant. I got a much-needed confidence boost from my husband who said, “Put them on, it’s fun!” and then he added, “You should be proud!” I AM proud! 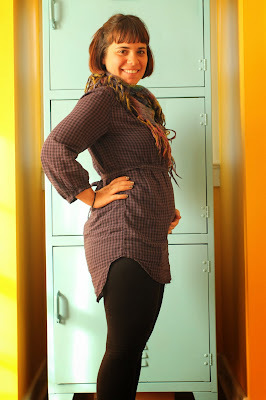 I was also lucky because a friend of mine gave me a ton of maternity pants. So check with your girlfriends who have children--they might be willing to help you out and get you in some maternity pants! Thanks Dawn! We can't wait, either!! lots of love to you guys! You look beautiful already!! I loved being pregnant, first time more than second, but overall its a wonderful experience. Enjoy! Thanks Cata! I definitely feel that I am starting to enjoy it more now that I am entering the second trimester. The first was a little tough for me!